Suzuki Music Education is a method of learning that originated with Dr. Shinichi Suzuki in 1945. It is based on the way young children learn to speak their mother tongue. In fact, it may be termed the mother tongue approach to education. How young can you start? Starting is based on child readiness. Some students have started playing as young as three years old. Do you have to be a musically trained parent? No. The joy of sharing in this method leads the parent to a greater musical awareness. Your child will grow musically if you just apply these methods. Do children lean to read music in this method? Yes. When they are ready. Playing comes first just as speaking comes before reading. How important is parent involvement? Very. One or both parents attend every lesson. The joy of the method is working together and discovering together. All students attend one private lesson per week and one group class per week. Beginning students will have a 15-30 minute lesson depending on their age and ability to focus. Group class is 50 minutes in length. What is the purpose of group class? 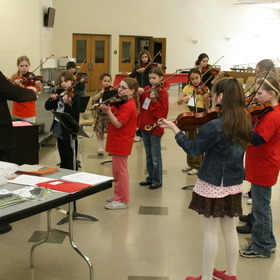 Group class allows students with similar musical development to work on and reinforce techniques and musical concepts learned in private lessons in a motivational environment. Direction following skills, self-discipline, audience skills, teamwork, constructive criticism and preparation for performance are all accomplished through group class participation.